I had spent many days pondering what it might be like. Crazy, funky, cool? Weird...that's probably the best word I can use to describe Japan. An eclectic contrast between modern concepts and traditional customs. People say you have to take adventures to figure out where you truly belong. Japan made me feel like an alien on a unknown planet, yet somehow I felt I could belong and live happily amongst the orderly hustle and bustle that encompasses everyday life here. 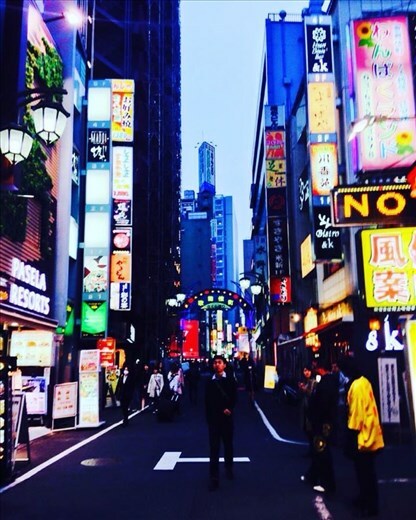 Tokyo, a city full of neon lights, streets buzzing with businessmen, fashionistas and students all impeccably dressed and walking obediently, as if regimented. Silent traffic obey the correct signals and pedestrians get fined for jaywalking, you could be forgiven for forgetting that some 117 million people occupy this country. The trains are futuristic and impeccably clean, soaring between stations where locals stand in silence in perfect lines. Everyone bows courteously...just to say hello, and talking on your mobile phone in public definitely appears frowned upon. Tokyo, I imagine, is maybe the only city in the world where English written signs make no sense at all and appear to be there solely for artistic purposes. Underneath it's clean and sparkly exterior, Tokyo hides a somewhat exciting and trashy core. An evening of drinking Sake, the local potent and musky drink of choice would open our eyes to an off the wall city where late night drunken karaoke is the normal way to let your hair down. Japanese karaoke bars are like no other. They offer private, pay by the hour rooms, every song under the sun and a waiter on the end of the phone delivering all the Sake you can drink in a plush, cosy environment. Needless to say, these nights are messy....but you're always in good company. So called 'love hotels' seemed to pop up out of nowhere as soon as the moon came out. Surprising in a city that was seemingly kept under an obedient lock and key. Heavily occupied on a weekend, love hotels involve a vending machine to obtain your key and a themed boudoir with a bill that charges by the hour, not by the night. Interesting concept to say the least. Don't be fooled by Japan's sickly sweet exterior of cat cafes (I personally can't think of a better way to spend my day) and hello kitty themed everything's, Tokyo is a dark horse. Mount Fuji, Japan's tallest mountain mainly hid its beauty behind grey drizzle and low clouds back in the Mid April weather. But even behind the curtain of dreary weather we caught sights of it laying beautifully on Japan's bumpy horizon. Our main reason for visiting Japan at this time of year was certainly not for it's weather, but rather for it's world famous cherry blossom. Spring time in Japan is defined by cherry blossom. Life becomes a cherry blossom tinted lens where petals fall like snowflakes and the air smells sweet. Signs pop up in local parks instructing how to play safe in the petals, and dogs in coats and scarves roll around the pink piles on the ground. We maybe missed the cherry blossom at its peak, it's hard to judge when it will be in its prime, and falls quickly. But I was pretty happy to have caught even the back end of the much celebrated Sakura (cherry blossom) season.